The 1960's was a time of turmoil for Hamilton. I guess it really started in the 1950's when Benrus attempted a hostile takeover. Oddly enough, Hamilton outlasted Benrus as the last great American watch manufacturer of the age. 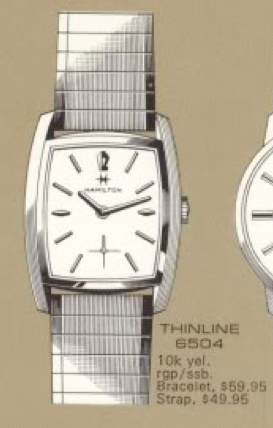 You have to hand it to the Hamilton executives though - they put on a "full court press" all they way through to 1969 when the last US-made movements were produced in Lancaster PA. Hamilton had a deep product line of offerings. One of the models that was introduced in the "bitter end" was the 1968 Thinline 6504. It would be produced in 1969 too. There are over 80 different Thinline models in all different shapes, sizes and case materials. It would be a fun challenge to try to collect them all. The Thinline 6504 came in a 10K rolled gold plated case with a stainless steel back. The dial has a pearlescent finish with applied figures. Under the dial is a Hamilton 639 movement - you don't see that very often. I recently scored a very nice original Thinline 6504 with it's original bracelet. Surprisingly, I was able to get it for a real deal too - which is nice. I've noticed a lot more competition for watches lately - I hope it not due to my blog! Ha ha! My new project watch came with it's original sticker on the back of the case. It made identifying it very easy - that's for sure. The Swiss-made 639 doesn't say inside who the maker is. However, a little research revealed that it's based on the 10.5 ligne Buren 280 movement. Buren and Hamilton were in the process of merging in late 1960's. When looked at from the side you can see why the 639 was used in Thinline models. It is very skinny. Everything gets taken apart and cleaned. There are no marks inside the case back to indicate the watch had ever been serviced. In fact, other than a couple of minor scratches to the bracelet, it's very hard to tell if the watch was ever even worn. It was surprisingly dirty inside though - based on how the color of my cleaning solution changed. And it's always good to make sure there is fresh oil in any "new" vintage watch you obtain. A little tweaking to the regulator gets it to balance out pretty much on a perfect 18,000 beats per hour. And here's the finished product all cleaned up and purring away as it should. My photo makes the case and hands look like they have black accents - those are just reflections. The case has a matte finish (brushed) on the sides but it's bright around the crystal. The hands are bright too so they are reflecting the darkness outside my light tent.